What fun giving answers to these questions – fellow writers, help yourselves! What is the working title of your book? Night Must Wait and it looks like this will be the final title too. Where did the idea come from for the book? I grew up in Nigeria and loved the wondrous opportunities this gave me. However, when I was about ten years old the country split on ethnic and religious lines in civil war, with the area I lived in declaring independence as the nation of Biafra. My family was evacuated with other expatriate families. What genre does your book fall under? I’d answer that it straddles. This is a story of strong women in jeopardy, whose intrinsic flaws emerge under the fantastic pressures of being outsiders caught up in an intimate conflict. So it’s a thriller, it’s a war adventure and perhaps it’s even a women’s book though I believe it will appeal beyond gender lines! In fact all the authors writing my blurbs are men, something I didn’t realize until the other day. Which actors would you choose to play your characters in a movie rendition? Oh my, that is an indulgent question. Clare Danes for the ornithologist spy Wilton, Kate Winslet for Doctor Gilman, and Russell Crowe for the mercenary Jantor. Lynn Collins for Lindsey Kinner the calculating powerful economist, Scarlett Johanssen for the geologist Sandy, and Tony Kgoroge for my man without a tribe, Oroko. What is the one-sentence synopsis of your book? Four American women friends pursue power in Africa, when the explosion of the Nigerian civil war triggers civil war between them. Will your book be self-published or represented by an agency? I’ve been fortunate to have Toni Lopopolo as my agent and she made the match between my book and an independent publisher, Imajin Books. How long did it take you to write the first draft of your manuscript? Insane howls of laughter here! My first draft I wrote in less than six months but that was back in 1976. I have rewritten it an uncounted number of times since, most successfully with Toni Lopopolo giving the kind of help as an editor that I’d been warned never to dream of in my wildest fantasies. She’s brilliant. What other books would you compare this story to within your genre? It’s a cross-over genre but perhaps Forsythe’s The Dogs of War, or Half of a Yellow Sun by Chimamanda Adichie, and I could wish that some parts might have a touch of the haunting that Christopher Abani achieves in his Song For Night, about Biafran child-soldiers in the Nigerian civil war. Who or what inspired you to write this book? My ever present feeling of being an alien in every place I have lived, however much I have loved it, and the knowledge that of the things you can change, or people you can help it has to be done one piece at a time, never from a position of patronage, never fuelled by any illusion of superiority or righteousness. My parents, who took us to Africa and let us have years there, is the other answer. Mystery and murders, a touch of romance, though I will warn you that never for any of my women is a man the center of her universe– and a sense of the wondrous world and ever changing beauty of Africa and her people. I hope I open a door in your mind, so that you participate in a place you’ve never been, become people who never were, caught up in a real crisis in a time that was real too. We’re back in civilization and I’m at a barbeque doing my best to be good company. “So what’s your novel about?” the lady said, perfectly coiffed, delicately buffed and polished, foundation and eye liner applied with the touch of practice. I guess I should have said –you’re so right, I’d better go back and fix that. I lost some of what she was saying at this point, my ears buzzing with an uncomfortable vibration of rage and disbelief. She felt we’d had enough, and turned away to buttonhole another conversationalist. In the fourteenth century what was going on in Nigeria? Well, indeed, my lady. Back in the thirteen hundreds what were all of you and a half of my ancestors too, doing in Europe? What do you know of Nigeria’s Yoruba kingdoms, The Edo state kingdom of Benin? Don’t forget the Igbo Kingdom of Nri which began, we think, around 900 C.E., the Sokoto Caliphate of the North, the kingdoms of Nupe and the ancient Nok culture smelting iron on the Jos Plateau before 500B.C.E.? And all this in a climate that made it hard to preserve any kind of written record, in a land full of disease and parasites that the Europeans never had to fight. Woulda, coulda, shoulda. I didn’t manage to do that history reminder, but it makes me quiet today. Kingdoms rise and kingdoms fall. I cannot see my way clear to sneer at any of them. I think of Kipling’s warning in his poem ‘Recessional’ written for Queen Victoria’s Jubilee. Lest we forget—lest we forget! …. Splendid day with John and Carmen who arrived at nine AM. We talked so much it was hard to get us out the door to hike in to one of our old sites. Upper Dutch Diggins yielded a fine day of fossils, leaves and fruits and seeds all original organic material, and a renewal of a delightful friendship between families. Sun and sweat and discoveries are the finest of things to share. We were so sorry to say goodbye after dinner and watch John and Carmen head off home, a good couple of hours drive for them. John said he might be back in a couple of days but we weren’t quite sure how long we’d stay, with our own work calling us home. A great wake-up. Nothing like the jolt of adrenaline to get you going in the dark. Yep. Not a little smoke, but when we went out walking about the bunkhouse, smoke you could see against the tall trees, fuzzing their outlines. Husband deliberated, so did I. He realized the wind direction was the issue, and I noted that although the smoke was present, we saw no glow and there were no ashes falling. However we did go up the long rutted road and unlocked the gate to the mine, dragged it open, so that if an evacuation was in order it would be easier for the locals to see we were in residence and alert us, and so that our departure could be efficient and fast. We’ve felt fires closer than this and been spared evacuation. One more point, there wasn’t any traffic on the main highway up above the bunkhouse, and if the fire were drawing near there would be. Went back to bed. Can’t say it was a great sleep but we woke to a smoggy-looking morning. Another day of fossil prospecting in the area with variable results, but we made sure to check in at the LaPorte Store, where scant news was available. Some reassurance that the fire wasn’t an immediate threat to our area. Despite the oppression of a long day filled with smoke from the Chip Fire, we saw it begin to rise at the end as the wind shifted again and we could see some blue sky by evening. We unlocked the gate at the Taber Mine and drove down the rutted road with our old 1972 Suburban clattering and creaking over the water bars. Drove into the cleared spot before the bunkhouse and scrambled out. Quiet. Light in the towering firs and pines, the bunkhouse looming three stores overhead, its old stained sides the hue of bitter chocolate in the tree-dusk. Sound of water trickling out of an overflow to the mine pond below us. 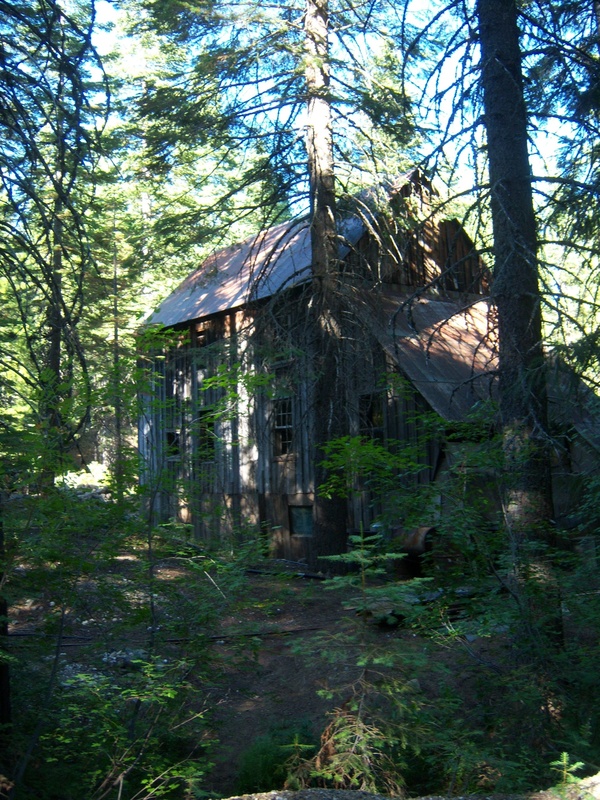 The mine and bunkhouse lie tucked into the upper point of a ravine, and as in so much of the Sierra, that means water runs down forever and you have that lovely sound so rare where we come from in So.Cal.. Birds in the branches, then the whir of a hummingbird. I never caught a good enough look to identify it to species. We set to making up our sandwiches, mixed up iced tea, ravenously ate every crumb. Last of the tomatoes from our home garden, dill pickes and good Dubliner cheese with ham. 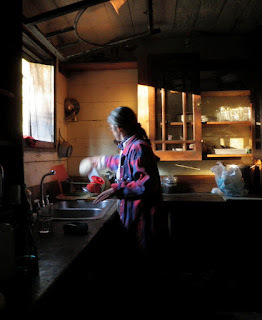 Walked through the bunkhouse and it felt as if we’d just been there a couple of days before, the same sense of generosity giving grace to the painted wood of the kitchen with its old wood burning range, the old glass chimneys of kerosene lanterns waiting on the top shelves, cast iron pans and a mix of fine china. Upstairs that long wide room that runs the entire length of the bunkhouse, windows on both sides, couches and a particular table set under the window made of single giant plank of wood. “I want to write stories there,” said the kid, running her hand over the ridges that tell of hand-sawing. Tiny wood stove up at one end by another desk. Dead mouse under the bookcase. We explored, read the notes John had left for winter visitors warning them of how they had to be careful of setting the stove-pipe right before lighting the stove. Not to worry — we would have no need of that. Not only did we have our own vintage Coleman, but John had set up what looked to be a brand new propane stove atop the old wood-burner. We would boil all our water, not being sure of our water source. Both husband and kid have had adventures with intestinal parasites from uncertain water sources.